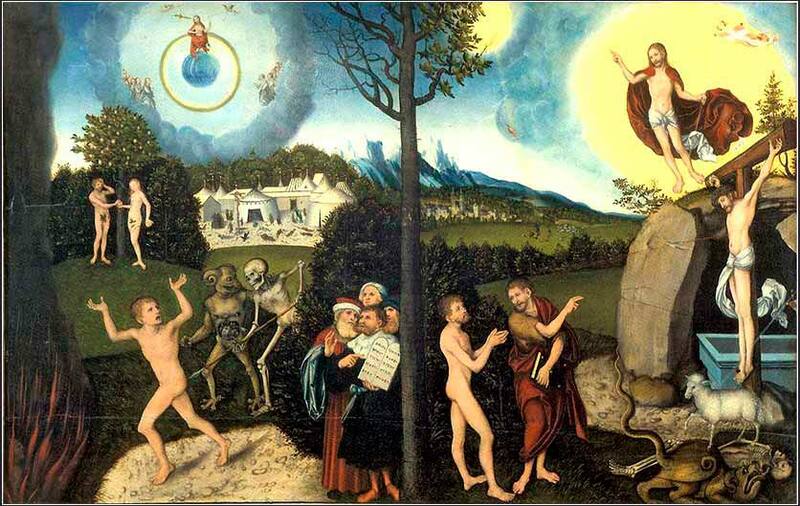 Law and Grace by Lucas Cranach, the Elder, ca. 1529. This remarkable work illustrates the entire Bible, from Genesis (left) to Revelation (bottom right). The Old and News Testaments are divided by the large tree - notice that it is dead on the left, but alive on the right. There is a wealth of wonderful detail, such as Moses’ bronze serpent staff, barely visible in front of the white tents. (See Full-size) Perhaps the hardest incident to decipher is the coming of the Holy Spirit, represented by a yod of flame coming from the sun, on the right of the tree. The angelic voice of a remarkable little girl, singing the praise of another remarkable young girl. Abraham was the father of Isaac, who was the father of Jacob, who was the father of Judah and his brothers, who was the father of Perez and Zerah (whose mother was Tamar). Perez was the father of Hezron, who was the father of Ram, who was the father of Amminadab, who was the father of Nahshon, who was the father of Salmon, who was the father of Boaz (whose mother was Rahab). Boaz was the father of Obed (whose mother was Ruth), and Obed was the father of Jesse, who was the father of King David. If you have ever read Matthew cold, the beginning is discouraging: line after line of such riveting prose as, “ And Judas begat Phares and Zara of Thamar; and Phares begat Esrom;” Is Matthew trying to bore us senseless? We said yesterday that two of the distinguishing characteristics of Matthew were that he wrote his gospel for the Jews, and that he wrote it with a strong them of Jesus as King. These verses, so impenetrable to the modern reader, had primary importance to those two purposes. A Jew in 100 A.D. would have found them as riveting as we find them tedious. By the time of Christ, Judaism had become rigid, institutionalized and closed, very different from the freewheeling and open Hebrew society we saw in Exodus. Persons whose blood was not pure Hebrew were suspect. If Jesus were to be considered the king, he needed to show not only that he was pure Jewish, but also that his blood was royal. Also, as we will see tomorrow, part of the prophecy of the Messiah was that it would come from the progeny of the great King David. So we see three things of immense importance to the Jews, if they were to accept Christ as King and Savior. That he was a real Jew, with an unblemished heritage all the way back to Abraham; that he was eligible to be the true King of the Jews, with royal blood; and that he fulfilled the prophecies that the Messiah would spring from the root of Jesses and from the line of David. 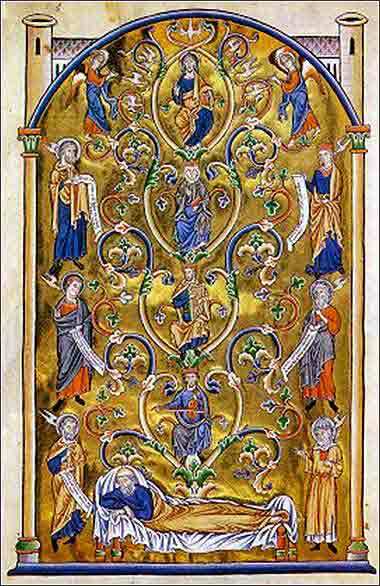 Tree of Jesse from the Ingeberg Psalter, French, ca. 1210.